Go from Standard to Stunning!!! 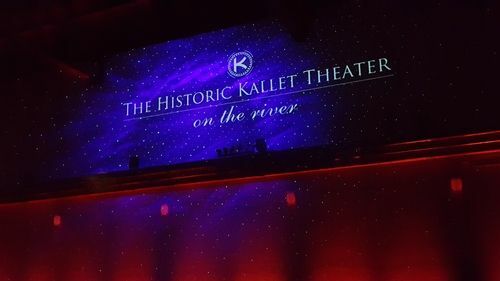 The Kallet Theater is one of only a handful of premiere venues in Upstate New York to offer state-of-the-art lighting pre-installed! 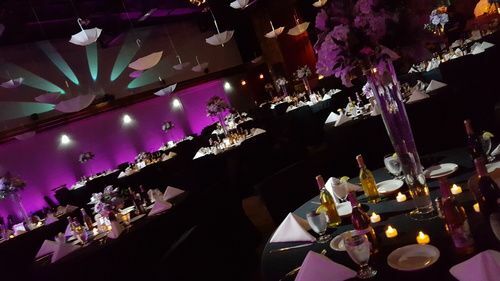 Our $30,000 system affords our clients the unique privilege of being able to tailor their theme and decor with no limit to creativity, but WITHOUT the added service costs when renting from a mobile vendor. With literally dozens of effects at your disposal, our planner will sit down and discuss the many options available to you. To simplify your experience, we've prepared this article for you to show you many of our most popular and often requested lighting features. 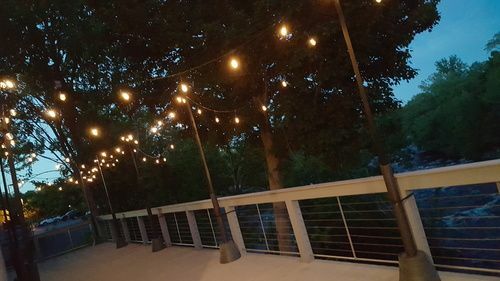 Installed along the entire stretch of our back deck overlooking the salmon river, these rustic-themed bulbs provide natural, warm-white illumination at night, or can be set to a red, green or blue gem-stone color for a festive, outdoor deck party. These fixtures are available to all our clients at no extra cost. For our ballroom, we give couples the ability to choose any custom color they wish to adorn our lower perimeter. Thin white drapery hangs from a ledge to diffuse the wash of the uplighting installed along each wall. In most of our packages, this is available at absolutely zero added cost! 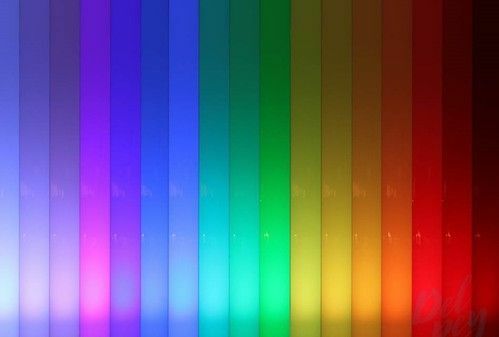 While we're able to achieve nearly 3,000 custom colors, these swatches offer a general range within the spectrum we can offer. White can be added to any of the above to create precise pastel shades to match or compliment your theme, fashion and decor. An upgrade to our decorative lighting, this allows couples to create multiple layers and schemes to be used throughout your reception, allowing the mood and atmosphere to be adjusted over time. Softened, warmer tones for cocktail hour, natural candlelight effects throughout dinner, then brighter, livelier hues for high-energy segments such as your introductions & grand finale! 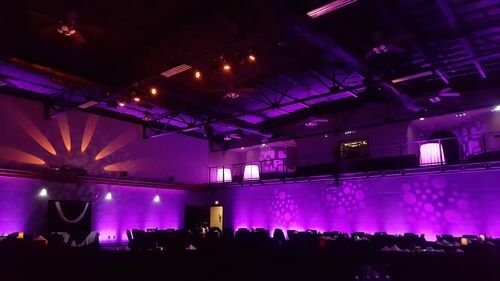 With 7 preset colors and images for adding visual textures to wall sections, floors, or stage curtains, these 4 units installed overhead can be used to cast select patterns and spotlighting virtually anywhere in our ballroom. 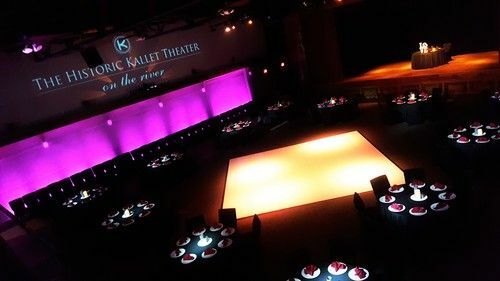 With the same range of colors offered by our uplighting, these fixtures are installed in our ceiling and cast diffused light down onto the ballroom floor for a subtle tint of illumination. They can likewise be used to light our stage with a slightly more colorful hue than normally afforded by standard stage lighting. Each fixture casts a 20' diameter of soft-edged light in any color, including warm or cool white - anywhere in our ballroom. 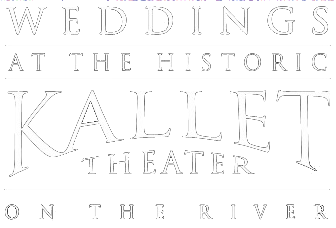 The Kallet is rare in that it is one of only a handful of venues in upstate New York equipped with a 100% artificially conditioned lightscape - where sunlight cannot pierce, outshine, or otherwise interfere with your lighting scheme, as natural light through windows often does. Please let your photographer know about this well in advance, as many special camera settings and other technical precautions need to be considered in order for your lighting and camera crews to work well together --Another reason to consider one of our in-house specialists who are trained to account and compensate accordingly for such differences. In the end, the value of this investment cannot be overstated. Lighting has a unique ability to enthrall and captivate, and can be enjoyed by all your guests the ENTIRE time! Consider also that unlike other forms of decor, lighting can be changed and doesn't require you to spend time on the day of your wedding rushing around to get it set up! Furthermore. it affects every guest each moment of the day ...and gets remembered in ALL of your photos! Truly, nothing else in your wedding day lends even a fraction of the impact that controlled lighting can offer!